Abstract: This editorial explains the principles of constant mass flow (CMF), how it can be achieved, and why it is used with some rebreather designs. This editorial is a simplified explanation of the CMF principle, and is only written to assist with the understanding of CMF rebreathers. The author of this article does not accept any responsibility for the use of this information for building or modifying existing rebreathers. When the conditions to reach maximum or sonic speed are achieved, increasing or decreasing the pressure at the entrance of the hole or even vacuuming on the exit side of the hole, the speed of the gas-travelling through the hole will not change, but stay constant at Vmax. This also means, with a fixed diameter orifice, as long as P1 >= 2 x P2, we have constant volume flow. Now we must be careful: The volume flow is constant once sonic speed is reached. Please note that the volume flow is not the same as the amount of gas, the amount of molecules of that gas, or grams of gas. When diving rebreathers we are mostly not interested in what volume of O2 goes through our orifice, but more on how many molecules of oxygen, (similar to how many grams / minute) flows into our system. by increasing the density of the gas. The denser the gas, the more molecules/litre, so even with a fixed volume flow, but having a denser gas, the number of molecules/minute, or the grams/minute ( = the MASS flow) can increase. How can we increase the density of the gas? The density of the gas can be increased, by compressing the gas, (=by increasing P1). 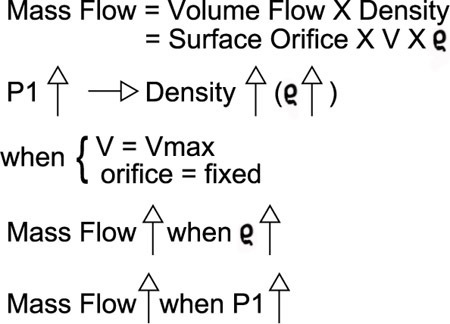 So when P1 increases, the density of the gas p will increase, and the MASS flow, (density x volume flow) will increase. 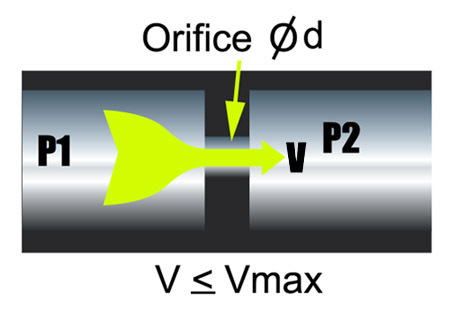 Example: When we meet the conditions of sonic flow (Vmax), so that we have Constant Volume Flow, but we double the inlet pressure at the orifice, we double the density of the gas, we will double the MASS flow through the orifice. For this test we take a normal scuba regulator first stage and connect it to an oxygen tank. 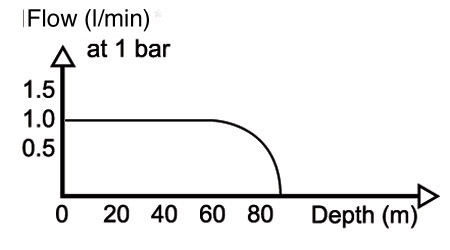 The pressure at the outlet of the first stage, the intermediate pressure (IP) is set at 10 bar absolute pressure. To this outlet we connect an orifice with a fixed diameter and the outlet of the orifice flows in the breathing bag of our rebreather. Normal scuba regulators are designed so they sense the pressure of the surrounding water, and adjust there IP, so that the difference between the IP and the ambient pressure of the water (the pressure in the water when diving) stays constant: this is needed for the second stage, normally attached to the first stage, to operate correctly while diving. This means that a normal scuba regulator will always increase its IP with the water pressure it is sensing. Suppose we choose the diameter of the orifice this way, that at surface, with the IP, or P1, set at 10 bars, we have a flow of 1 l/min (measured at the surface! !, so +/- 1.43 grams/min). P1 is 10 bars, the outlet pressure (P2) is 1 bar (at surface), so P1 is more then twice P2, we have sonic speed, so we reach maximum volume flow. Now we go diving with our rebreathers and descend to 20meters depth. The absolute pressure in the water is now 3 bars, so P2 has increased 2 bars, from 1 to 3, so the regulator has also adjusted (increased) its IP with 2 bars, and so now P1 = 12 bars. We still have maximum volume flow (as P1 = 12 is still more then twice P2 = 3), so the volume flow did not change. But what happened: as P1 increased from 10 to 12 bars, the gas (oxygen) at the inlet has been compressed by 20% (from 10 -> 12 bars), and so has become 20% more dense, so our MASS flow (volume flow multiplied by density of the gas) has increased by 20%! So now +/- 1.72 grams/min flows trough our orifice! If we could now measure the flow at surface again, we would measure 1.2 l/min! 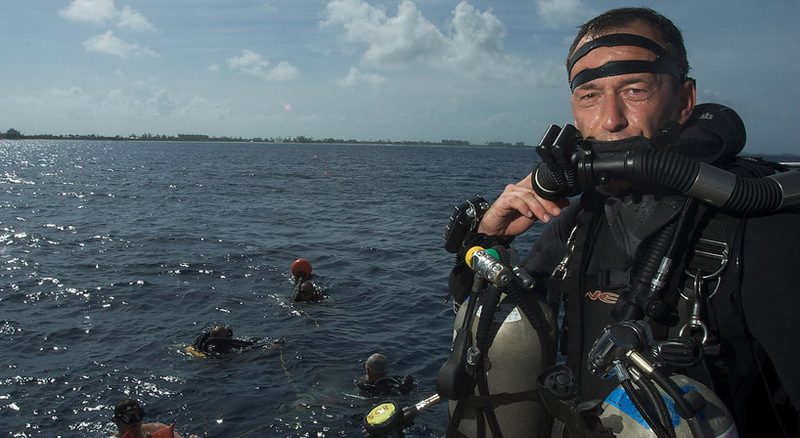 We notice the deeper we go, using our system with a normal scuba regulator connected to the oxygen tank, the mass flow of oxygen (and so the volume flow measured at 1 bar), increases when we descend: we do not have a constant mass flow of oxygen. Again we dive to 20m. The absolute pressure in the water is now 3 bars, but, since the regulator does not sense the water pressure, it does not adjust its intermediate pressure, so P1 still stays at 10 bars absolute. Do we still have maximum volume flow? 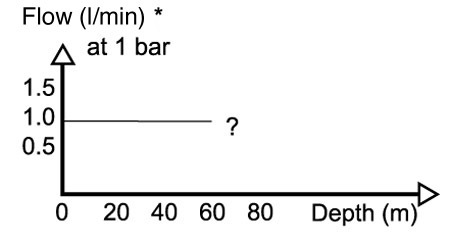 Yes, as P1 (10 bars) is still more then twice P2 (3 bars): so the volume flow has not changed. We now have a CONSTANT mass flow. This is the desired result we want when we have oxygen flowing into a rebreather: A constant mass injection of oxygen into the breathing bag, so that it just compensates for the basic oxygen consumption of our body (metabolic consumption) when we are at rest, or moving very slowly. Since our metabolic consumption does not change with depth, we dont want the oxygen mass flow into the breathing bag change when we descend or ascent: we want it to stay constant. The extra amount of oxygen our body needs when we do more exertion can then be added manually in a mCCR, or electronically in the hCCR. If the oxygen mass flow would increase when we go down, the mass flow would quickly become higher then our metabolic consumption, and so the PPO2 of the gas would rise, and become hyperoxic, so we would have to flush it down continuously with a diluent gas. We descent to 60m, the pressure in the water is now 7 bars, the IP is still 10 bars, now P1 is not minimum twice P2 anymore.. (10 and 7): the condition to have sonic flow, and so maximum volume flow, is not achieved any more! The speed of the gas trough the orifice has become less then max, so the volume flow has dropped, and since the density (determined by P1) has not changed, our mass flow has dropped! We dont have CMF. the pressure in the water P2 will increase and come closer to P1 (the IP), the velocity of the gas will keep dropping and so will the mass flow, until we reach 90m. At that point the pressure in the water equals the intermediate pressure (both 10 bars), there is no pressure difference over the orifice anymore, so no gas will flow through it, thus the mass flow has dropped to zero. Now what does this mean when we dive a rebreather with an absolute pressure regulator (so that we can use an orifice that delivers us a constant mass flow of oxygen over a range of depths): It means that the maximum operation depth of the rebreather is limited to the depth, where the IP equals the pressure in the water. Because at that depth or deeper, no oxygen can be added to the system, as also the manual add valves (MAV) will not provide flow when activated. 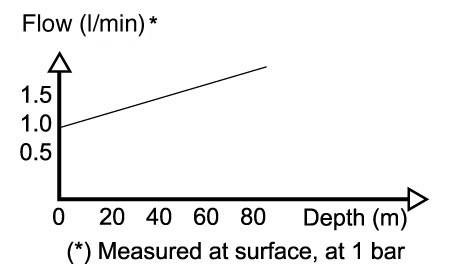 For the rEvo in mCCR or hCCR mode, we even limit the maximum operation depth to 20m less then the depth where the IP equals the water pressure: as the graph shows. At that depth there is still a reasonable mass flow through the orifice, and still enough differential pressure over the MAV to inject extra oxygen. 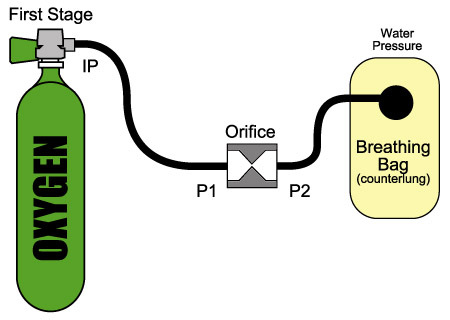 In the normal rEvo setup, the IP is set at +/- 11 bars absolute (10 bars overpressure) and the flow at surface is +/- 0.8l/min. At a depth of 100m, the water pressure equals the IP, so the maximum recommended working depth of the rEvo in mCCR of hCCR mode is 80m. 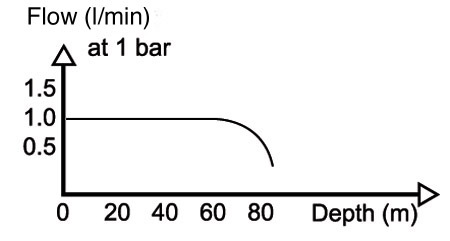 Lowering the IP, to decrease the mass flow to mach the flow to a lower metabolic consumption, will also decrease the maximum operation depth of the unit: Every bar the IP is decreased, the maximum recommended operation depth decreases with 10m. In case we do not want to have any depth limitation, the first stage has to be a "normal" depth compensated scuba regulator, but in that case a fixed orifice can not be used: so if there is an orifice in the system and we want to use a normal regulator to go deeper, the orifice has to be blocked. 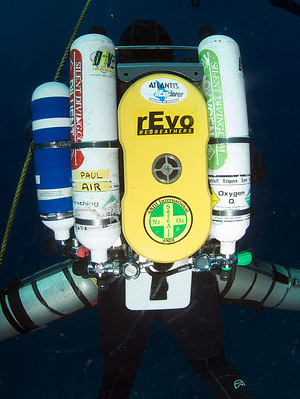 This is not practical for mCCR diving, but possible for the hybrid CCR version: By removing the cap from the first stage, turning it into a normal scuba regulator, and blocking off the orifice with a plug, the hCCR-rEvo is changed into a "pure" eCCR. In this case the maximum recommended working depth is 100m.